Braking components are absolutely vital to the safe running of your vehicle and the safety of those around you. ‘Lightweight’ brake discs are advertised in the market place to increase fuel economy but is this really the best option? In order to be competitive, some manufacturers cut their production and distribution costs by reducing the quantity and quality of materials used during manufacture. Reduced weight can affect the discs ability to dissipate heat, which can have a detrimental effect on the efficiency of your brakes. Some distributors and technicians are unknowingly supplying and fitting these discs and, depending on driving style, this can lead to increased warranty claims and potentially, total failure of the disc. Thinner friction plates with increased air gap – less material to absorb and dissipate heat, increasing the chance of brake fade, brake judder, Disc Thickness Variation and premature failure. Material cost savings – More chance of uneven wear, braking noise and brittleness with the potential to cause cracks. Vent vane sizes reduced – Can result in premature structural failure of the disc. These changes do not replicate OE specifications. A brake discs inability to dissipate heat will result in an increased risk of brake fade and severely reduced brake performance. In reality, was it cheaper or was it exactly what you paid for? Cutting costs often means cutting quality. This can lead to more problems down the road with drivers experiencing issues such as brake judder. A major cause of brake judder is Disc Thickness Variation (DTV), which is commonly misdiagnosed as ‘warped’ discs. This occurs when the brake disc becomes worn in a single area of the disc’s surface and is often caused by excessive run-out. The question you have to ask, is it worth it? 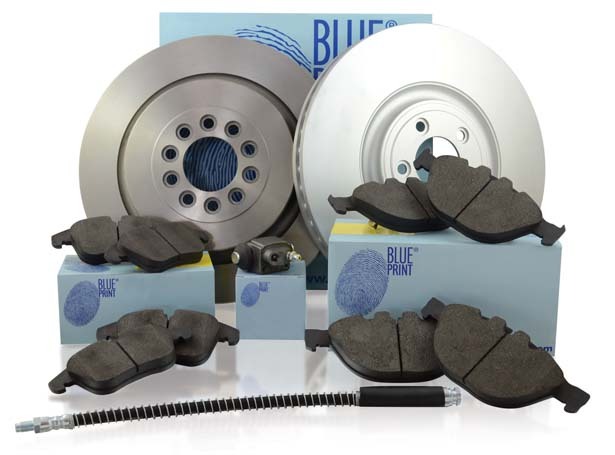 Blue Print supplies an extensive range of over 10,000 Braking components, including discs, pads, sensors and more. Blue Print’s impressive range of brake discs, including high-carbon discs, are balanced to minimise noise and vibration in order to ensure comfort. All discs are researched, specified and manufactured to be OE matching replacements, in accordance with ECE-90 regulations, and our ‘Three year unlimited mileage warranty’ against manufacturing defects guarantees quality. Check the brake fluid level and condition, allowing space for fluid to return from the pistons as they’re retracted. Replace the fluid if necessary. Loosen wheel bolts before raising the vehicle. With the vehicle raised and supported safely, remove the wheels and inspect the rims and tyres for any abnormal wear or damage. Inspect all surrounding components for wear and damage. These include steering and suspension parts, bushes, bearings, hoses, connectors, ABS sensors, and shock absorbers. Worn suspension parts can cause vibration under braking and extend braking distance. Using suitable tools, remove the caliper and move to one side. Do NOT hang the caliper by the brake hose. Some vehicles may have a pad wear indicator that will need disconnecting. Remove the brake pads and guide plates. Retract the brake caliper piston using the correct tool to avoid any damage. When removing the brake disc, avoid excessive force as this can cause damage to wheel hubs, bearings and ABS sensors. Inspect the old discs and pads. Wear patterns can indicate underlying faults with adjacent components. Thoroughly clean the wheel hub with a wire wheel or brush, ensuring all corrosion is removed. Uneven surfaces lead to problems such as judder and disc thickness variation. Fit the new brake disc. Some brake discs come with an oil-based protective coating which must be removed before fitting. Clean the caliper and inspect for damage, especially on the protective dust cover and slider guides. Clean the caliper carrier and inspect guide bolts. Apply brake grease to the contact surfaces of the carrier and guide plates where fitted. Refit the caliper carrier, ensuring the bolts are tightened to the vehicle manufacturer’s recommended torque setting. Apply ceramic paste to the contact surfaces of the new brake pads, without getting any on the friction surfaces. The pads should fit easily into the carriers without the need for force. 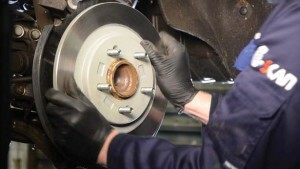 Refit the caliper, ensuring it is tightened to the manufacturer’s specifications, and reconnect the brake pad wear indicator where fitted. Inspect and clean the wheel fittings, and replace any that appear worn or damaged. When refitting the wheels, avoid tightening using an impact wrench. Lower the vehicle before tightening the bolts to the manufacturer’s specifications using a torque wrench. Press the brake pedal until normal pedal pressure is felt. Check the brake fluid level and top up if required. Test drive the vehicle to ensure correct operation of the braking system. For more detailed instructions, or a visual guide, visit the Blue Print YouTube channel and watch the whole process. 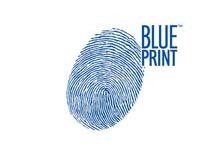 Blue Print TV provides technical and top tip videos, using our comprehensive industry knowledge to support customers with online assistance. The influence of other components on the parts you’re told to replace could hide the root of the problem – Always check all braking parts during repairs to avoid missing anything. Want to know more about the Blue Print braking range? Seeek out Blue Print at Automechanika Birmingham!